Did you know that proper dental care can add 3-5 years to your pet’s life? Did you know that February is National Pet Dental Health Month? For these reasons, during the months of February AND March, we are discounting our Dental Services by 10%*!! 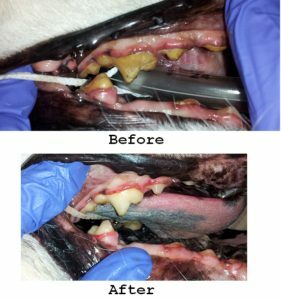 Unsure if your pet needs a Dental Cleaning? Call to make an appointment for a FREE Dental Exam and receive a FREE toothbrush or finger brush and a sample of Enzymatic toothpaste to help keep your pet’s teeth clean all year long. During Dental Month we will also offer 10% off on Hills T/D food, Greenies dental chews and Enzymatic toothpaste to help keep your canine and felines teeth in good health between cleanings.